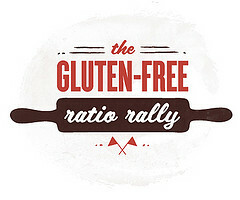 I am SO very excited to be part of the Gluten Free Ratio Rally! Each month the group posts recipes based on a specific food (normally made with gluten but changed to gluten free) that they have created by starting with a ratio. Some use the same proportions (taken from Michael Ruhlman’s book Ratio ), but you also have the freedom to create new ones based on your preferences. The goal is to remove the mystique from baking and inspire a sense of ability and adventure. That is my kind of fun! This month, Mary Fran from Franny Cakes challenged everyone with brownies. (I LOVE the name of her blog. AND she will be presenting at the Nourished Food Blogger Conference I am attending! Double-woo!!) I think most brownie lovers fall firmly into two camps: Chewy-fudgy brownies and those that are more cake-like. Personally, the more chocolate the better, so I fall firmly into the chewy-fudgy group. Mmmm… My husband on the other hand, is an equal opportunity brownie lover. As long as it is chocolate it is all good to him! He tells me he needs extra chocolate to help with his “magnesium deficiency” to explain away missing chocolate chips from my baking cupboard. Uh-huh… sure, hon. Any-hoo… eh-hem… Back to the brownies! I have my favorite brownies as the base to these. I developed them about 7 years ago after some trial and error when I wanted brownies that were gluten free, dairy free, tasted like baked fudge AND had that shiny cracked top that I associated with brownies. The secret to get the shiny top on these brownies I discovered by accident thanks to having 3 kids distracting me while I am baking: leave the batter to sit for 30 minutes after pouring in the pan before you bake it. Works every time! The topping is to mimic the cream eggs that come out every year. You know the ones: the shiny foil, the mysterious white and yellow interior, the milk chocolate that is off limits to my family. Again, you love them or hate them. I have been seeing several recipes for homemade cream eggs lately, so decided to adapt that idea into an Easter brownie. I think these brownies give you that naughty little indulgence with a better ratio of chocolate to filling, with more vanilla overtones, all without making your teeth ache. LOL! These are very rich, so I cut them into smaller 1 1/2″ brownies. I have not been able to make the brownie base egg free, as the eggs are the liquid and really hold things together (not to mention that shiny crackled top). If you would like and egg free gfcf brownie base for these, try Babycake’s Allergen Free Brownies. Preheat oven to 350 F. Melt chocolate, oil, and sugar in a sauce pan on med-low heat, stirring well so the ingredients are properly combined. Transfer to mixing bowl and allow to cool slightly. Sift gluten-free flour, cocoa and baking powder into the mixture and stir well. Add the beaten eggs. Stir until well blended. Line an oiled 10 x 7 inch or 9 x 9 inch cake pan with parchment paper. Lightly oil paper. Pour in mixture. Let batter sit 30 min. (NOTE: because you are going to be putting a topping on these you DO NOT need to let the brownies sit for 30 minutes to get a crackled top. I skipped that step.) Bake in preheated oven for about 35 minutes. Test with a toothpick in the centre to check that it’s cooked through. Allow to cool completely. After brownies are cooled, mix together the cream egg layer ingredients, except food coloring, until well blended. Put 3/4 of the cream egg topping on the brownies and carefully smooth it into an even layer. Add a bit of yellow food coloring to the last 1/4 of the cream egg topping in the bowl and mix well. Drop small spoonfuls of the yellow on top to the white topping and as evenly as you can spread with a spoon. Lay a piece of plastic wrap directly onto of the cream egg layer. Refrigerate for one hour. When ready to add the chocolate layer, melt the chocolate layer ingredients in a small sauce pan, stirring constantly. When completely smooth, remove the plastic wrap from the brownies and top with the melted chocolate. Smooth chocolate to an even layer. Refrigerate brownies for at least a half hour for the chocolate to set up before slicing. Use parchment to lift brownies out of the pan. Gently remove parchment paper and slice. I find that if you freeze the brownies for about 20 minutes and clean your knife between slices, you get neater slices. Be sure to stop by and see all the yummy brownie recipes from the Gluten Free Ratio Rally this month. And thanks so much to our host, Mary Fran from Franny Cakes! What a creative and Easter-festive brownie! Sounds and looks delicious! I love this idea - and they look delicious! Interesting tip on the top crust of the brownie, too - I'll have to try it! 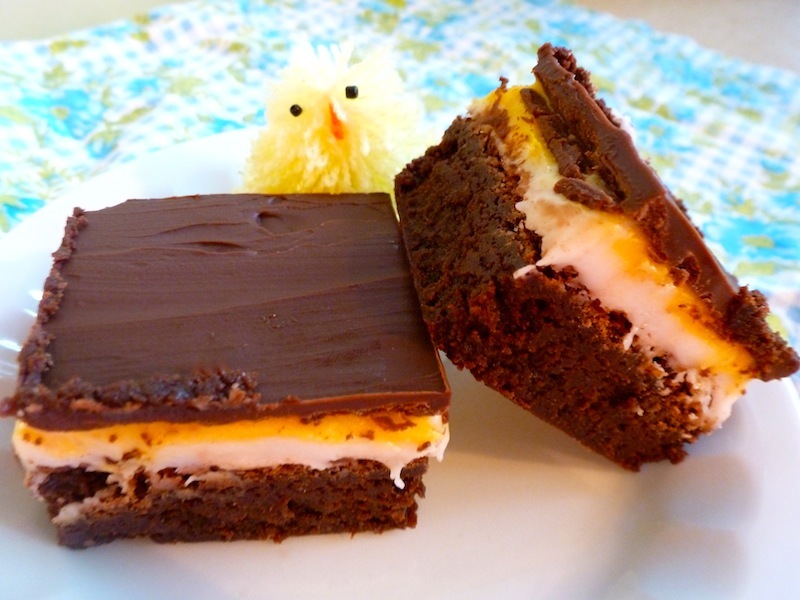 A cadbury egg in brownie form? genius! Very very creative!! Love this idea! It really is the perfect Easter brownie. Love that they are DF too. Thanks for sharing! I remember the last time I had a cream egg...I had an allergic reaction because I didn't think to look at the ingredients. I think I am going to have to try and make these! I'm picturing a floppy-eared bunny hopping by as I read this. Love this idea of the "cream egg" on top. Thanks for sharing and 'rallying' with us, Angela! these are hilarious and awesome! very well done... and thanks for sharing. Oh. My. (Gluten free) Goodness!!! This is ingenious, and so fitting for April. I hope to see more GFRR entries from you, for sure. Beautiful job, Angela!